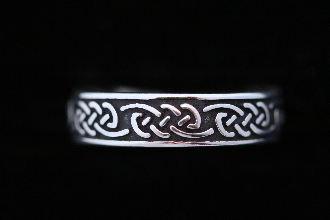 Our Products >> KNOTWORK BAND RINGS >> "Eternity knot band ring, womens"
This is the classic knotwork design is known as the Eternity knot. There is an essential melding of principals which is described by this 2 strand design. The energies of the invisible heavenly forces (Spirit) and those of the tangible realm (Earth). All life is expressed in terms of this unification of Heaven and Earth, those of the seen and unseen realities. The name for this particular pattern has become fairly widespread as the popularity of traditional patterns has increased, creating a need for verbal communication concerning these beautiful interlacings. "Eternity knot band ring, womens"